Sundays in Buenos Aires are sacred days reserved for food, family and fun. Locals linger at asados, drink mate in the park or stroll along the Costanera Sur. Although just a few years ago ‘brunch’ was a foreign concept in Argentina, the meal where breakfast and lunch collide has finally made it to Buenos Aires — mostly thanks to the vast expat community who can’t live without their pancakes and eggs. The word ‘brunch’ first appeared in print in a 1895 edition of the British magazine, Hunter’s Weekly, in an article entitled, ‘Brunch: A Plea’ by writer and trendsetter, Guy Beringer. He envisioned a Sunday afternoon meal designed for late-night revelers, which allowed them to skip church and sleep late. It was also his idea that brunch serve as one of the few instances when it is widely accepted – nay, encouraged – to begin drinking at the first meal of the day. With the Argentine fondness for festivities, late-nights and a declining church attendance, Buenos Aires is a perfect match for the most decadent and drawn-out meal of the week. Buenos Aires’ brunch menus typically include eggs in all shades of preparation such as huevos revueltos (scrambled) and eggs benedict, carbs in all their glory including French toast, waffles and pancakes, and all sorts of sandwiches and salads. In Buenos Aires brunch can even include the ubiquitous cut of steak. It is also common to pair brunch with champagne, mimosas, or an extra picante bloody mary. A handful of restaurants in the northern neighborhoods have jumped on the brunch bandwagon, providing ample choice for those whose asado invitation got lost in the mail. ‘Le grand petit déjeuner’ is typically served between 11 a.m. and 4 p.m. Visiting a favorite bar in the daytime can be a unseemly move – no one likes to see what’s behind the red velvet curtains and ambient lighting of last night party joint. Nighttime haunt, Magdalena’s Party cleans up nicely in the daylight however. Offerings include a crepe version of the traditional omelet, pancakes, waffles and the American Diner Special which includes eggs, potatoes, bacon and choice of toast or pancake. Magdalena’s bloody marys are made with a salsa also offered as a condiment, which means the drink can be extra chunky and not at all resembling what you may find at home. On the positive side, it packs a punch, as does the food with a great hot sauce selection including La Boca Roja, small local brand started by an American duo. Novecento, a restaurant first opened in New York by an Argentinean and later brought to Las Cañitas, has the same brunch ‘special’ every weekend. For a bit of a steep fee, diners are treated to multiple courses of culinary delight encapsulating the best of breakfast and lunch in Argentina. The prix fixe brunch includes a mimosa and enough bounty to distract from the conspicuous absence of bloody marys. Taking the guess work out of ordering, plates of eggs benedict, waffles with figs, nachos in a chile concoction, fried egg and sausage, French toast and a plate of sandwiches are served and enjoyed at a leisurely pace. bBlue Deli & Natural Bar in Palermo Soho and Natural Deli in Barrio Norte both offer brunch options and a wide array of juices and smoothies to boost immunity and rehydrate the body after a long weekend of parties. bBlue offers several brunch options such as the ‘b-Brunch’, which includes coffee, orange juice, scrambled eggs with salmon, bruschetta prosciutto, a medialuna (sweet croissant) and a muffin, but only until 12 p.m. They also offer a delicious bruschetta with scrambled eggs and smoked salmon and a large selection of salads and sandwiches all day. A similar venue, Natural Deli doesn’t actually serve ‘brunch’ but any breakfast item can be ordered at all hours including scrambled egg bruschetta with ham, smoked salmon or veggies, fruits and granola, and French toast. Natural Deli also has small but well-stocked shelves filled with natural ingredients, juices and more, so you can attend to your brunching and Sunday grocery shopping all at the same time. Locals may not have many reasons to visit hotels in Buenos Aires, but brunch should be the exception. As a decidedly foreign meal, it makes sense that restaurants catering to visitors know how to do brunch right. The Alvear Palace Hotel one of the most posh and upscale hotels in Buenos Aires, dishes out a large buffet-style brunch in their restaurant, L´Orangerie. Strangely, champagne is complimentary but mimosas are priced for the five star crowd. The ambiance is greatly affected by whether brunch is held upstairs, or in case of a special event, relegated to the bottom floor. Since most of the brunchers are hotel guests it should also be advised that buffet-style brunches are less impressive later in the day when the selection starts to wane. Home hotel, one of the premiere boutique hotels in Buenos Aires, is also celebrated for their brunch. Sitting outside and gawking at sunbathers by the pool is preferable to the indoor space, where housekeeping often walks by with their cleaning supplies. The eggs benedict are a bit scant on eggs and large on benedict — or rather really fluffy bread which may or may not actually be shortcake. The huevos rancheros are delicious though, and the salads are substantial. Steak with eggs á la Buenos Aires is on the menu. In truth, the loaf of bread provided is enough incentive to give this restaurant a try. Olsen is currently one of the city’s favored brunch spots — indeed reservations are a must prior to the weekend. The chique atmosphere in this Nordic restaurant is the best part including a well-maintained garden. 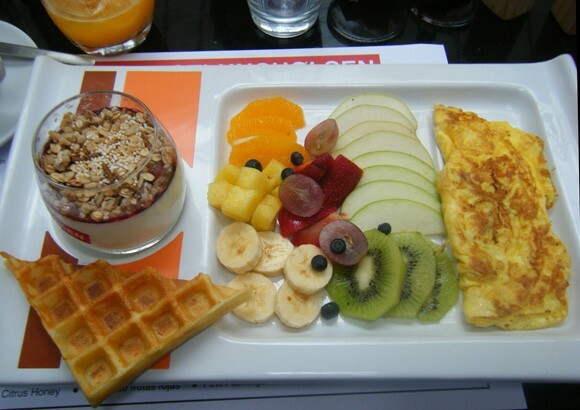 Brunch can be a simple café and medialunas,but yogurt, fruit, pancakes, omelets and scrambled eggs are on offer. There is also a more lunch-like options including sandwiches, grilled veggies, risotto and more. For the budget-minded, eating at Olson is all about strategic ordering. For a fixed price you can choose various options from the menu, some worth more than others. Waffles and a slice of bacon may not be worth the cost, but for the same price you can get yogurt, an omelet, toast, orange juice, fruit and a glass of champagne.